Nobody was listening, for they were all saying “open it, Pooh!” “What is it, Pooh?” “I know what it is” “No you don’t” and other helpful remarks of this sort. 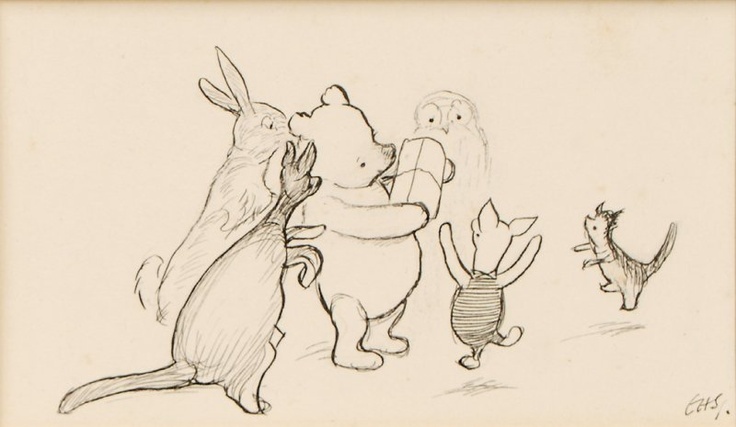 And of course Pooh was opening it as quickly as ever he could, but without cutting the string, because you never know when a piece of string might be Useful. At last it was undone. 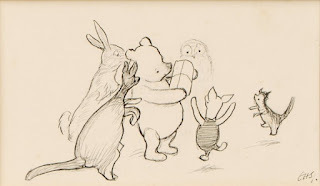 When Pooh saw what it was, he nearly fell down, he was so pleased. It was a Special Pencil Case. There were pencils in it marked "B" for Bear, and pencils marked "HB " for Helping Bear, and pencils marked "BB" for Brave Bear. There was a knife for sharpening the pencils, and indiarubber for rubbing out anything which you had spelt wrong, and a ruler for ruling lines for the words to walk on, and inches marked on the ruler in case you wanted to know how many inches anything was, and Blue Pencils and Red Pencils and Green Pencils for saying special things in blue and red and green. And all these lovely things were in little pockets of their own in a Special Case which shut with a click when you clicked it. And they were all for Pooh. "Oh, Pooh!" said everybody else except Eeyore. Zo dankbaar zijn voor kleine dingen: dat maakt je gelukkig. Ik wens het jullie allemaal toe voor 2016.